To us, at least, cauliflower seems like a wimp’s broccoli. As with zucchini, there is a huge literature on ways to sauce up cauliflower—cheese sauces seem particularly popular—but, as we say elsewhere, wouldn’t kraft paper taste good in such yummy sauces? Does anyone actually eat plain steamed cauliflower with, at most, a little butter? Couple its being insipid with its being a true pain in the elbow to grow—satisfactorily growing caulis is considered the acid test of home-gardening skill—and one must wonder “Why bother?” But here is the scoop for dogged fans of the thing. Looking at all the many problems of growing these little snowflakes, we have decided to try the over-wintering approach. That, too, is a small gamble, because even “over-wintering” caulis are not bullet-proof as to frosts and freezes. Still, our chosen cultivar, selected after some review, is said to “withstand frost from 16°F to -5°F, depending on wind and snow cover”; considering that on average (ever-dangerous term) our coldest overnight low of the year is 16°F., we feel it a good gamble. That cultivar is the Galleon; it’s a British development, and seed is not easy (but not impossible) to come by in the U.S. Timing, even for over-wintering types, is still a bit delicate. What is wanted is a plant about 6" tall by first fall frost. We need to check further, but it looks like direct-seeding in early July is the target. Unlike many other vegetables, cauliflower actually prefers a rather heavy soil, firmly tamped. (Light-textured soils can produce earlier crops, but heavier soils better hold moisture.) The soil pH is ideally “sweet” (non-acidic), hence the frequent references in the literature to liming the soil for them—but it’s not lime as such, it’s the right pH that they need (a high pH also helps control clubroot disease, but you and we carefully rotate our Brassicas—you do, yes?—so that’s not much of an issue with us). Something about pH 6.8 seems about right. The soil should not be fertilized heavily, since rich soil since can encourage soft, sappy growth that is more susceptible to cold damage. Cauliflowers want a sunny spot for growing. Cauliflowers need lots of water, supplied on an even, regular basis. They don’t mind wet leaves—indeed, they seem to rather like them—so water heavily. At recommended spacings, you should have a “living-mulch” leaf canopy, but nonetheless weed scrupulously. Top-dressing the plants mid-season with fish or seaweed fertilizer is a good idea. 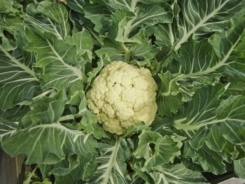 Older cauliflower types required “blanching”—having their leaves tied over the developing head to shield it from direct sun—to stay that desired white color. Many of the modern cauliflower types “self-blanch”, that is, fold their leaves over the head naturally (as we understand it, all cauliflowers tend to do that—it’s just that the habit has been encouraged in the modern forms). But the worst that can happen is that the heads yellow up somewhat, whcih does not affect their eating quality. In the following spring, be sure to harvest promptly, before the heads start to “rice” and the curds to loosen. Cut a good bit of the stem along with the head. Cauliflower is a member of the Brassica family, which also includes broccoli (a close relative), Brussels sprouts, kale, rutabagas, turnips, kohlrabi, radishes, and various lesser crops like seakale and the true cresses (notably watercress). It is naturally a biennial plant; its flowers are hermaphrodite (have both male and female organs) and are typically pollinated by bees, making the plant self-fertile. The history of cauliflower is part of the overall history of cole crops (for which see the page on broccoli). As tastes in southern Europe shifted to eating the immature flower buds of cole crops, the newer varities began to emerge from their common ancestor. By the 15th century, the vegetable we today know as cauliflower had developed (this is, curiously, about a century before modern broccoli emerged.) Cauliflower was mainly restricted to Italy till the 16th century, when—with so much else of food from Italy—it was introduced to France, and thence eventually to other areas of Europe. It was first grown in North America in the late 1600s. The growth pattern of cauliflower curds is one of many things in nature that illustrate the curious mathematical series known as Fibonacci numbers. You loaded this page on Friday, 19 April 2019, at 16:19 EDT. It was last modified on Tuesday, 29 January 2019, at 00:52 EST.